I never thought as I started reading this one, that I’d get so much enjoyment out of it. It took me by surprise; one of those moments that make this hobby so worth it. It all began with clippings from newspapers, written in a way that suggested they were merely pieces of a puzzle. Indeed, that set my mind ablaze with theories that wouldn’t subside throughout the entire book. I loved how it gave me a new perspective over the characters, how they interacted with each other, and in general how they were presented. Haysom was clever enough to give enough of a tease that pulled me in, made me want to know more, and I very much appreciated it. As I believe it, this is a debut novel, yet I wouldn’t have guessed. Many of the pitfalls new authors fall into - such as a lack of sufficient editing and typical horror tropes that are almost painfully overused at this point - were largely absent, giving an almost fresh take. 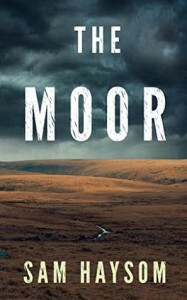 The atmosphere of Rutmoor, of how utterly miserable and arduous the travel became, it created vivid imagery in my head, and induced a very strong aversion to hiking. I can now say it's not something I want to do ever, in my lifetime. Honestly, the dynamic of the hiking group was a highlight; it had that pinch of realism to it. Each individual offered something unique with their personality, and like any real life circle, they all differed and even clashed together. Sometimes it was ugly, other times sweet, but most of all, their friendships were authentic. My favourite had to be Tom; undoubtedly the most sensible of the lot, followed by Matt and James. Even despite the young age of each, I was still able to relate. Yes, there was some immaturity - pretty much what you'd expect from teens, but it wasn't to the extreme. The format of the plot struck me as quite different, in that rather than waiting until the end to reveal the big twist, it was just after fifty percent that it came into play. I can’t say it was unexpected - in fact, I had my suspicions much earlier, but I adored it regardless. You see, I much prefer when the direction of the story changes so drastically from my initial assumptions. If it’s done well, like it so wonderfully was in this case, then I feel like I’m kept on my toes, like I don’t have time to even look away. The question of survival played a significant part, as due to the parallel running chapters of present day (2015 to be precise), those that endured the horrors of the moor were made known, thus it was not the matter of who’s going to survive, but how do they survive. The only thing that I found quite awkward, was the continual switch of past / present tense in the style of writing, however I understand it was used as a tool - to obviously convey the period of time, and perhaps even to alleviate confusion. Nevertheless, it was a bit of a challenge to get used to it. In conclusion: I considered it a great story, and to be completely truthful, it soared above my expectations. With a slow beginning of character and atmosphere building, the story exploded into a creepfest that kept my attention. My applause goes to Haysom, and his impressive debut novel. The rabbit's body was a mangled pulp of flesh, bone and hair. Its eyeless, earless face stared up at him from the grass. Patches of drying blood lay on the grass around it. From somewhere behind Gary, a tree branch snapped.